Adebanji Alade ROI creates remarkable paintings about people and places. 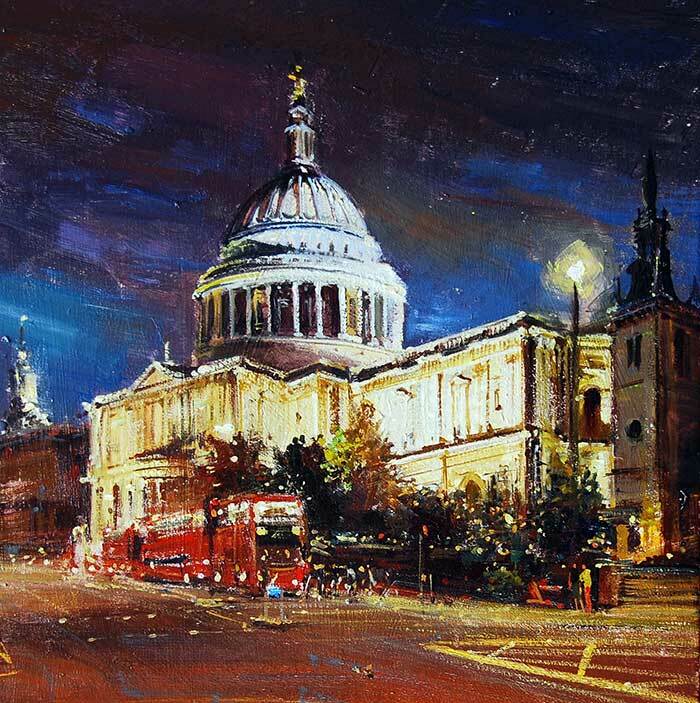 His oil painting, ‘St Paul’s at Night’, is available as a Christmas card in Mall Galleries bookshop. With his mastery of depicting light and activity in oils, Adebanji perfectly captures the hustle, bustle and festive spirit of London at Christmas. We asked him about his creative process, his life as a teacher and his love of historic London. Why did you choose to paint St Paul’s in a night scene as opposed to another London landmark? I chose St Paul’s because this particular edifice is my favourite place to paint at nighttime in London. It stands out as a remarkable beacon of light on London’s skyline and has hardly changed from how it was many centuries ago. Regarding your painterly tips and tricks, you have two techniques that you term ‘inside-out’ and ‘outside-in’ respectively. Can you explain what these terms mean and how you put them into practice? I have two main ways to which I approach my paintings. The easier method is ‘outside-in’ where I block-in the main bold shapes in the picture very quickly to get an overall feel for the subject I’m painting. Once I have done this, I then refine the bold shapes and bring them to become more detailed, so it’s started outside and finished inside. The ‘inside-out’ method is a bit trickier and demands my drawing skills to be at their best! I start from a small spot in the painting and finish that spot. Then I gradually spread out to other parts of the painting, finishing each area as I go along. It’s almost like walking a tightrope - risky but interesting! You started teaching at Heatherley’s School of Fine Art in Chelsea in 2015. What is your favourite aspect of teaching and why? Have you learnt any artistic lessons from your students? My favourite aspect of teaching is being able to help students solve the problems they encounter in their paintings. It is so rewarding and fulfilling because I believe we are all here to make life easier and more pleasant for someone else. Three of the greatest lessons I have learnt from students is to always slow down, to remain hungry and to keep learning myself. Slowing down means being more careful at the beginning to make sure the drawing is right. Whenever I am not hungry for excellence the end result is mediocre, and that’s one of the things I dread most. Once I stop learning I’m dead. Finally, what are your plans for this year’s festive season? Last year I went to Portugal and it was great, and this year I am hoping to be in Nigeria to enjoy the festive season with my family and friends, like I did in 2015! Be on social media. Don’t be a Luddite. Share with Instagram, Twitter and Facebook. Tori has sold a piece via the internet an hour after finishing it! The moral of the story might be: wait until the painting is dry before you share it on Facebook! Networking. Horrible word, but you do need to do it. Don’t hand your business cards out at a funeral (a true story – yes, really!) But do get to know your fellow artists. We would probably rather lock ourselves away in the studio and paint, but we make ourselves go to exhibitions, and talks, etc. This advice was given as part of FBA Futures 2017, we had a lovely evening of networking and advice at Bermondsey Arts Club, an off-shoot of Artistic Spaces who’ve been offering a prize at FBA Futures since 2014. Sophie Hill of Bow Arts/Nunnery Gallery (formerly a member of Mall Galleries’ staff and worked on FBA Futures 2014 and 2015) gave us an idea of the many and varied opportunities for professional development offered by the Bow Arts Trust in their Bow Skills programme. Joshua Waterhouse, an FBA Futures exhibitor from 2015, spoke honesty and eloquently about the trials and joys of being a professional artist in London. Inspired by The Society of Women Artists’ Summer Exhibition and in response to the recently launched £100,000 Freelands Award, we invited some expert speakers in the field to join us for a panel discussion exploring the continued relevance of Women-only art exhibitions and competitions. The Speakers included Sue Jelley, President of the Society of Women Artists, an organisation founded over 160 years ago when there were very limited opportunities for women to exhibit their work; Melanie Cassoff, Managing Director of the Freelands Foundation, who launched the new Freelands Award in response to a report they commissioned on the mid-career opportunities for women artists and Eliza Gluckman, Curator of the New Hall Art Collection, a collection housed at the Murray Edwards College, which itself was founded to allow women to attend Cambridge University and independent curator working on projects including 'A Woman’s Place'. The Debate was Chaired by Susan Mumford, the founder of the Association of Women Art Dealers and Be Smart About Art, organisations which offer professional support and mentoring to both artists and art dealers. The panel found that while there have been huge strides in improving women’s access to arts education and exhibition over the 160 years since the founding of the Society of Women Artists, and since the founding of the New Hall Art Collection in the 1980s, there is much room for improvement. They concluded that by working together the gender gap can be closed still further. Read more about Women Only?! New English Art Club member Peter Clossick shortlisted for the Columbia Threadneedle Prize 2016. Peter Clossick, a member of the New English Art Club has been shortlisted for the Columbia Threadneedle Prize 2016 for his work; Summer Solstice. His work, alongside many others, will be on display during the exhibition in February. Read more about New English Art Club member Peter Clossick shortlisted for the Columbia Threadneedle Prize 2016. Lewis McNaught, Director of Mall Galleries discusses Akash Bhatt RBA's work Blue Room. 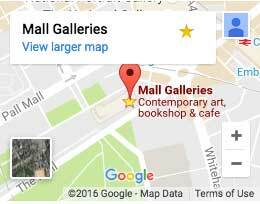 The work is part of the Sunday Times Watercolour Competition Exhibition at Mall Galleries. Lewis McNaught, Director of Mall Galleries discusses Charlotte Johnson Wahl's work Ward Round, a Consultant and his Firm. The work is part of the Minding Too Much: A Charlotte Johnson Wahl Retrospective Exhibition at Mall Galleries. The Royal Academy has announced the big winners at their Summer Exhibition 2015. At the top of the list for painting, sculpture and drawing, respectively, are Rose Wylie (winner of The Charles Wollaston Award), Tim Shaw (winner, The Jack Goldhill Award for Sculpture), and Carla Groppi (winner, The Hugh Casson Drawing Prize). However the above artists have something else in common other than their just-announced wins at the RA - they've all exhibited at The Threadneedle Prize, the country's most significant open submission competition for contemporary figurative art. 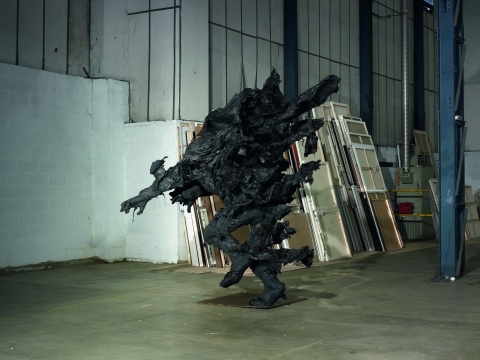 Tim Shaw exhibited in the inaugural edition of the Prize in 2008, showed the following year as a Shortlisted Artist, exhibited again in 2010, and was invited back as a Selector for The Threadneedle Prize 2013. Wylie was shortlisted for the Prize alongside Shaw in 2009, while Carla Groppi exhibited more recently in 2013, her work even featuring as the catalogue cover. In 2013, Carla Groppi exhibited a pastel drawing, After Atget (5) Parc de Saint-Cloud, and in 2010, Shaw, his foam, black plastic sculpture, Man on Fire; if these titles seem familiar, they should do... over at the Royal Academy, Shaw has just won for his work, Man on Fire Version II, and Groppi, with After Atget (44) - works similar or in the same series as those shown at The Threadneedle Prize. Congratulations to all three artists for their continued success. Meanwhile we look forward to seeing the works submitted for the next edition of The Threadneedle Prize, now The Columbia Threadneedle Prize: Figurative Art Today, which opens for submissions on 13 July - the first prize of which is £20,000 and a solo show at Mall Galleries. The Prize invites submissions of figurative or representational paintings, drawings, original prints, sculpture, mixed media constructions, small scale installations and reliefs that are strong and topical observations on the world around us. Lewis McNaught, Director of Mall Galleries discusses Jennifer Anderson's work - The Directors: A Portrait of Neil MacGregor, Director of the British Museum, London, and Tom Campbell, Director of the Metropolitan Museum, New York. Part of the Royal Society of Portrait Painters Annual Open Exhibition 2015. Director of Mall Galleries, Lewis McNaught, shares his view on a work by Laura Such in the Royal Society of British Artists Annual Exhibition.